The museum is finally getting ready to transport the Norwegian aircraft Boeing 737 from the military airport and over to the museum grounds. The plan is to integrate the aircraft in to the exhibit, whilst remaining on the outside of the museum. The museum is excited to finally be moving towards the Boeing as a new attraction. The planning for the actual transport is in progress, but it is not an easy task since the aircrafts weight is proving to be a challenge. According to our conservator Michael Loftus the aircraft is now being prepared for the move with an extra coat of protection, paint and corrosion-treatment, and the tires are being checked thoroughly. The Norwegian Aviation Museum is aiming to finish the groundwork outside of the museum and finalized the transport within the year, but it does unfortunately not mean that it can be accessed during this time. Due to the resources and funds needed for this project it will therefore be a project with several phases. Phase one will involve the physical transport of the aircraft and placing and securing it on the museum grounds. It is in the second fase however that the work continues with providing the object as a piece of the exhibit and communicating the history of the object in a manner worthy of the aircraft. It is also the plan that the aircraft will be developed as a teaching opportunity for students at the Aircraft mechanics academy. - It is important for us that we find the opportunities for how we the integrate the aircraft in the exhibit in the best possible way, says the Director of the National Aviation Museum Hanne Jakhelln. Even though the transport distance for the aircraft is relatively short, the preparations have taken a long time for various reasons. For one, the aircraft is inside a closed off military facility. Secondly there are fences that needs to be removed and terrain that is not suitable for the weight of moving a 30 ton Boeing. The heavy weight also creates the need for a plattform for the plane to stand on, once placed at the museum. Together these obstacles have made the process longer, and difficult for the museum to meet the costs of the project. The museum has now received word from the Air Force that they will assist with the practical aspects of the transport, a help that is greatly appreciated. 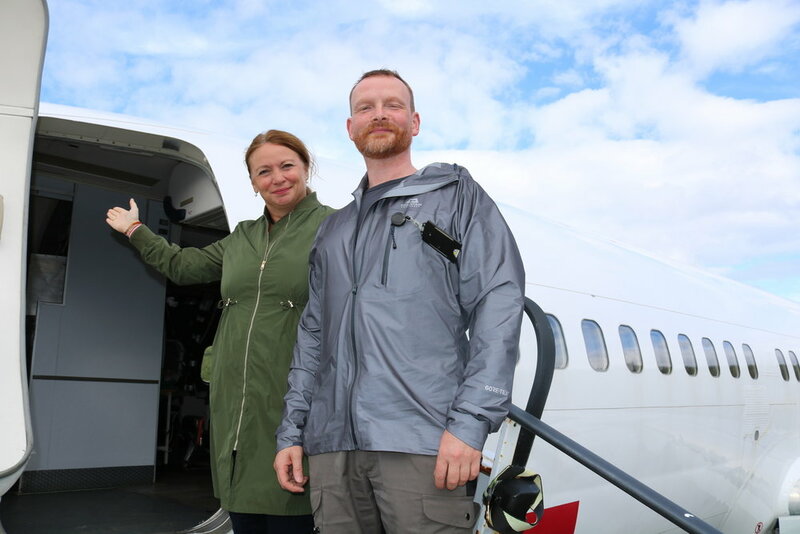 Second in command at the Air Force base in Bodø, Vegard Bøthun, has promised to provide the recourses to go through with the actual transport. The Air force has also been keeping the aircraft safe on their grounds during the wait, which the museum also values greatly. The Boeing is planned to be placed outside the museum, on the side that faces the military base. How it will be integrated and possibly attached to the museum, remains to be seen. Conservator Michael Loftus is responsible for keeping the aircraft moistfree and well maintained. He has been preparing the aircraft for transport for some time. According to him the tires are one of the things that needs to be seen to before we proceed. - There is a risk that they can blow, so we need to address this beforehand, says Loftus. - It is important for us to be able to communicate the history of the aircraft in the best possible way, at the same time we need to ensure that it will survive under the open sky for a long time. This is also why it has taken a long time to plan. We are now looking forward to finally getting this prominent aircraft on the musem grounds, according to the director. All enquiries about the Boeing 737 is to be directed to the Head of press.